Posted by jeremyliew in 2011, Internet. I was interviewed on Bloomberg TV this morning about internet trends. It’s about a five minute video. You will have to click through to Youtube to watch as Bloomberg doesn’t allow embedded video watching. Posted by jeremyliew in Internet, jon miller. Once he does sign, which seems likely, Miller will become News Corp.’s chief digital officer, reporting directly to the media giant’s head, Rupert Murdoch. Based in New York, he will also be chairman and CEO of the newly created News Digital Media group. Sources noted that this is a a different and larger platform for Miller, bigger than just the Fox Interactive Media job that Levinsohn held. It will go across all properties held by News Corp. across the globe. “The idea is to mainstream the digital initiatives, which have been all over the company,” said one source close to the situation. I worked for and with Jon for seven years, both at IAC and at AOL. He is terrific; a premier strategist and thinker about the online world. AOL did terrifically well under his leadership, and took a marked and immediate turn for the worse when he left. He has a huge palette to paint with with the Newscorp digital assets. Congrats to both Jon and Newscorp. 1. 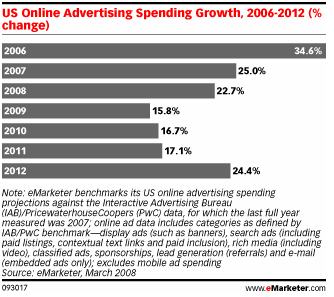 Only 5 of “top 20” US Advertisers spent more than the industry average of 8% of their ad budgets online. P&G (#1) spent 2%, AT&T (#2) spent 6%, Time Warner (#5) spent 6%, Glaxo Smith Kline (#7) spent 2%, J&J (#8) spent 3% and Unilever (#10) spent 5%. 3. Top countries for social networking penetration: Brazil & South Korea. Top country for e-commerce penetration: Germany. Top country for online gaming penetration: China. Top country for mobile payments penetration: Japan. Top country for microtransactions via SMS penetration: Philippines. Top country for online advertising penetration: UK. Top country for broadband penetration: South Korea. US has headroom in all of these areas based on other countries experiences. Posted by jeremyliew in advertising, Internet, recession. Checks with large online buyers confirm the obvious – that discretionary and some lending-oriented financial verticals remain weak. Also, we do not forecast a speedy recovery of the auto sector, though comments from overseas manufacturers are encouraging, with brands such as Audi planning to double its online ad budget this year, despite sales trends. Also encouraging are announcements from players in the hardest-hit verticals moving all ad spending online. For example, Century 21 Real Estate recently committed to moving 100% of its national ad campaigns to the Internet. Surprisingly, financial categories such as insurance, refinancing, and deposit accounts remain strong, as financial institutions seek to raise capital and take share in fee-based businesses. Also, education and books categories have been growing recently, with textbook retailers and continuing-education institutions such as the University of Phoenix seeking to capture counter-cyclical demand. Mitchell also identified travel as a potential area of weakness as airlines cut back capacity. However, he noted that there is a lot of hotel inventory currently in development that would come online over the next two years. These new hotels and resorts would likely drive travel advertising to recover. One other area that Mitchell noted may change in the future was pharmaceutical spending. While this has been holding up very well so far, he noted that some changes that the Obama administration is contemplating may limit pharmaceutical companies ability to advertise their products. Other attendees noted entertainment advertising (particularly movies), advocacy advertising (political issue based advertising) and CPG (consumer packaged goods) as areas that are showing continued strength, and “green” as an area that could potentially show weakness. James Mitchell, lead internet analyst for Goldman Sachs, presented to a group of around 100 internet and mobile media company CEOs that Lightspeed pulled together last week. Experience overseas leads us to believe that as Internet penetration, broadband penetration, smartphones and mobile access, and general comfort with the Internet grow, so too will online advertising as a percentage of total advertising. For example: Online advertising is 17% of total advertising in Korea, with search comprising 11% and display & other making up 6%. Korea reached 50% broadband penetration in 2001, when search advertising that year was about 2% of the total ad market. The US took until 2005 to reach those levels. Similarly, in the UK, online advertising is 13% of total advertising. In the US, online was only about 8% of the total at the end of 2008. We believe that the US and UK will catch up with Korea, and that the rest of the world will gradually converge with developed Internet economies. Further, we believe that the transition to online will occur more quickly in developing markets such as China, as advertisers “leapfrog” traditional forms of advertising and begin advertising solely or primarily online. He speculated that online advertising share of all advertising could reach as high as 23% if a scalable advertising solution for social media could be found. Clearly, the companies that make it through to the other side of this advertising recession will have plenty of growth left ahead of them. Posted by jeremyliew in Internet, mobile. The key to the iPhone’s success is the fact that it provides a unified, full browser experience, said Neil MacDonald, a Gartner analyst. By comparison, Windows Mobile is a fractured platform, with separate PDA and smartphone versions, as well as a version of the browser that doesn’t support full HTML. As broadband becomes more widespread web designers have created more elaborate designs, assuming that a large proportion of their audience is on broadband, or ignoring dial-up users entirely. Even iPhone users will acknowledge that visiting big web pages, especially those incorporating rich user interactions, can be a frustrating experience. Yet most pundits agree that web usage is only going to increase on mobile devices, despite the triple constraints of slower connections, slower processors and smaller form factors. I’d be curious to hear what readers think will happen as these two trends collide.